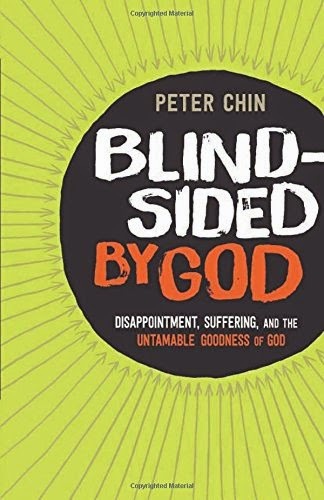 Behold & Reflect: Review of Peter Chin's "Blind-Sided By God"
What drew me to Peter Chin's memoir of his early days as a struggling church-planter in Washington D.C. was the story: within months of moving to their crime-ridden neighborhood, his family of four experienced miscarriage, burglaries, news of an aggressive form of breast cancer and a letter informing them their health insurance would not cover his wife's treatment. Just as Chin's wife, Carol, was about to go under the knife to remove her tumor, doctors discovered one more twist in the already impossible situation: She was 6-weeks pregnant. If anyone would have the right to doubt and complain to God in an all-out Job-like fashion, it would be the Chins. Why would God seem to make them choose between the well-being of their unborn baby and Carol's chances for beating an especially deadly cancer? Would the baby survive the toxic cocktail of chemotherapy required to treat Carol's cancer, which had also spread to her lymph nodes? And how on earth were they going to launch a new church amid chemo treatments and prenatal appointments? This is a book about Chins' doubts, suffering and growing up in his faith. Happily, it's a story with an incredible miracle conclusion that had me up late to read the entire book in one sitting. It's also a story with many small miracles-- the cross-cultural relationships the Chins built with their neighbors and congregants. The story and the hope it brings makes Blind-Sided By God worth reading. On the one hand, Chin is not afraid to honestly share his thoughts, motives and shortcomings, even at the risk of being painfully unflattering. On the other hand, Chin puts his seminary degree to good use by pairing each installment of the story with an exposition of scriptures that emphasize the suffering Christ and his followers experience. I especially liked his honest reflection on Christ's crying out "My God, My God, Why have You forsaken Me?" with his final breath on the cross. While acknowledging the traditional interpretation that Jesus had to be briefly separated from the Father in the moment he took on all of humanity's sin, Chin poses the possibility that Jesus experienced a genuine feeling of righteous lament and deep sadness and even confusion. And if Jesus can question the Father this way, God can handle our questions too. This is Chin's first book, and with phrases like "in no small way" and "suffice it to say" sprinkled throughout, his sometimes archaic style seems to be influenced by 19th century Christian classics. I also have to confess I scurried through a few of the more pastoral parts of the book to get back to the page-turning plot. Overall, I recommend this book for anyone who feels caught in a whirlwind but afraid to question God's hand in the tragedy, struggle and beautiful mess that often characterizes the Christian life.